September 11th has become a somber day of remembrance. 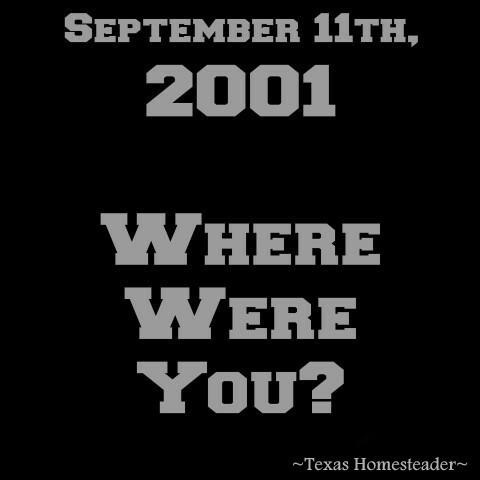 What were YOU doing on that fateful day? I’ve written before about my experience with that horrible day. September 11th, 2001. A day I’ll never forget. Do you remember where you were on that day? But although those memories are painful, they’re still part of our history. In those days of horror there was a real, shining thing to see. We witnessed real American moxxy. We came together as a nation. We dropped our petty bickering about the trivial matters of the day and we came together to help each other. We quit being ‘Us’ and ‘Them’ and just became Americans. Strong. Proud. Americans. My prayers continue for our beloved country, that we may always remember who we are. We’re Americans! This entry was posted in Blog Posts and tagged Fall on September 11, 2017 by Texas Homesteader.